Learn foundation and bead based techniques required to make earrings, bracelets and necklaces. Also learn about the different tools, beads and components that you can use. Further develop your beading, cord and wire skills so that you can make wire earrings and clasps, wire-wrapped pendants, multi-strand bracelets and chain necklaces. Suitable for all levels. Learn, step-by-step, how to design and make beautiful new vintage style jewellery out of old jewellery pieces and a handful of new components. Small class sizes. All materials, tools, lunch & refreshments provided. Keep what you make at no extra charge. 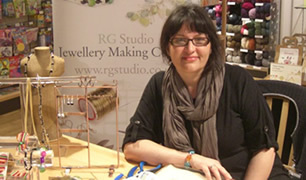 I am a professional jewellery maker, author of “How to Design Bead & Wire Jewellery” and a qualified teacher. I have been a teacher for over 20 years and have experience teaching both in the UK and abroad. In addition to my teaching, I also make and sell over 400 pieces of jewellery a year myself. I specialise in bead and wire. My jewellery making courses take place in Farnborough, Hampshire. Ideal if you live in London, Hampshire, Surrey, Berkshire, Sussex or surrounding areas. Only 5mins from the M3. Free off-road parking. Just 35mins from London Waterloo. Free collection from the train station available.